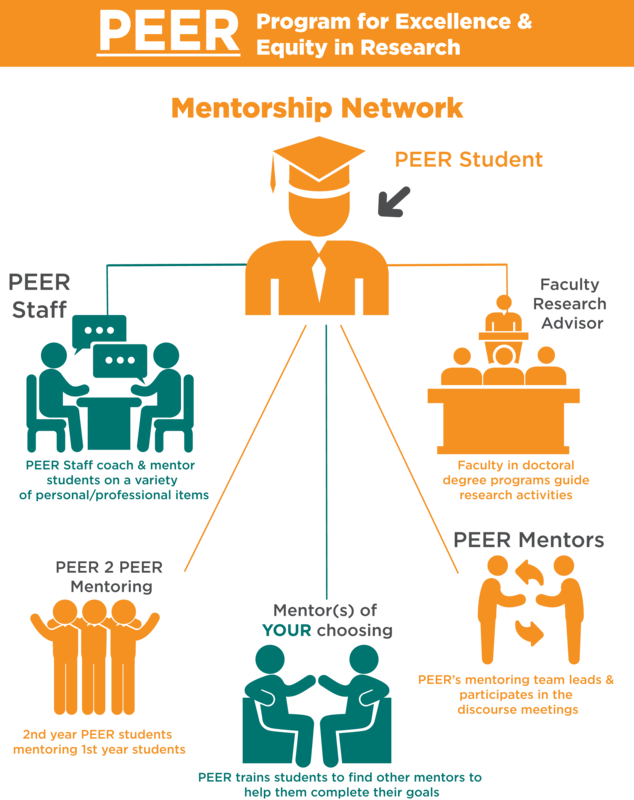 PEER provides many mentoring resources for incoming Ph.D students. Over the course of two years, PEER scholars will not only engage with mentors from faculty & administration, but will be trained to become mentors to enhance future career goals. Additionally, PEER collaborates on its mentorship activities with the UT Graduate School’s Office of Graduate Training & Mentorship. To understand how the network functions, review the graphic below! For a PEER student’s first year, one second year PEER student is paired with them to be a resource when navigating around issues that span from academic challenges to living in Knoxville. PEER students are often matched based on discipline and other factors that assist in preparing first-year students for doctoral study. PEER Mentors are UT faculty members from a variety of disciplines that lead professional development workshops and skill-building sessions every week for PEER students. Additionally, PEER Mentors serve as another resource for students to help them adapt to doctoral study, balance academic obligations with personal needs, and give insight into life at UT. See our PEER Mentors here. Prospective students interested in doctoral study are encouraged to reach out to faculty members at the beginning of the application process to establish their interest with the department and to discover what research opportunities are present. When accepted to a doctoral degree program at UT, students will work with a faculty advisor. PEER staff are available for day-to-day student inquiries and mentoring to advance PEER students toward their personal and professional goals. Additionally, PEER Staff will schedule training & mentoring events that equip PEER students with skills that enhance their career aspirations.